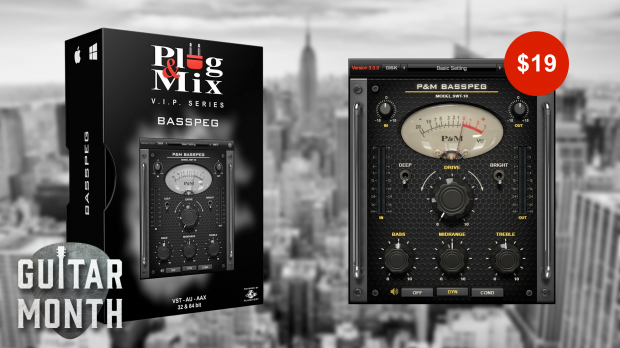 If your Bass tracks are lacking character, you need to put them through the P&M Basspeg to build them up. Try it out and then pick it up at 60% off during Guitar Month. Deep – Low frequency contour. Drive – Tube Distortion amount. Bright – Hi frequency boost. Bass – Low frequency amount. MidRange – Mid frequency amount. Treble – High frequency amount. This entry was posted in DontCrack, Plug & Mix, Plug-ins, Promotions and tagged Ampeg SVT, Bass Amp, Bass signal treatment, Basspeg, Plug & Mix, Plug and Mix. Bookmark the permalink.